A competitor prepares for the Blacksod Point Challenge. WITH THE SEASON drawing to a close, the Triathlon Ireland Junior Squad was looking to end on a high as they dominated the junior sections of one of the world’s biggest triathlon, the London Triathlon. Aaron O’Brien made a dramatic return after some injury trouble at the start of the season to win the junior race. O’Brien and fellow squad member Chris Mintern raced smart, with Mintern leading the field out of the water. The pair were shoulder to shoulder for the entire 5km run before O’Brien sprinted clear in the final metres. Team mate Kieran Jackson finished close behind in sixth place. In the youth section, Stephen Rooney was placed third in the boy’s race while Maedbh Hurst finished third in the girl’s race. U-23 athlete Russell White was racing among top elite athletes in the Senior Elite race. A noted swimmer, White exited the water in tenth place. A group of six had managed to break away with White working well in the second pack and ran well to finish 11th in a top quality field. At the World Duathlon Championships in France, Paul Carroll finished third in the 40-44 years category. Carroll covered the 10km run, 40km bike and 5km run in 1hr 55mins 25secs, finishing just a minute behind the winner, Bousser of France. Carroll has had an exceptional season, having already picked up the Irish Duathlon title and silver at the British Duathlon Championships. In domestic action, over 200 people braved the waters of Blacksod, Co. Mayo for the Blacksod Point Challenge. 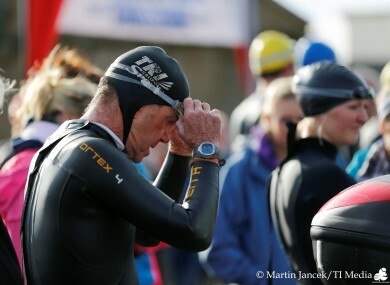 Kevin Thornton backed up his Pulse Triathlon performance with another win. Eamon Mc Andrew took second place and was followed by Martin Grealish in third. In the women’s race, Marie Boland won in a time of 2hr 19mins 49secs. Boland who was lying second for much of the race overhauled Katie Cooke late in the 10km run. Rachel Glendon was third, just 30 seconds back. The final race in the Vodafone National Series takes place in Co. Down at the Mourne Triathlon next weekend and with rankings tight at the top, it is sure to be a hard fought race. Email “Tri Talk: Aaron O'Brien sprints clear to capture junior race in London”. Feedback on “Tri Talk: Aaron O'Brien sprints clear to capture junior race in London”.